Ben’s baptism was a rushed one. We had a small crowd for our last baptism but it was beautiful. He is such a one-of-a-kind kid. He chose the 4th Article of Faith for his favorite “scripture” and so I quickly typed it up a little bit prettier than average for the program. I am offering it here as a FREE download for your personal and church use, should anyone be so inclined. How do I download this for my son’s baptism? I cannot find an editable link to a copy of it. I just saw this – I’m happy to send this to you. Do you want the program in Adobe InDesign or the 4th Article of Faith which is in Adobe Illustrator? Happy to share…you’ll need the fonts, though, to be able to edit the original files and I think I use Bickham Script Pro which is a relatively expensive font. I would like to use this for an upcoming baptism. Would you share a version that can be edited? Could this be sent to me also? I would love to be able to edit a copy as well, if I could get a link. 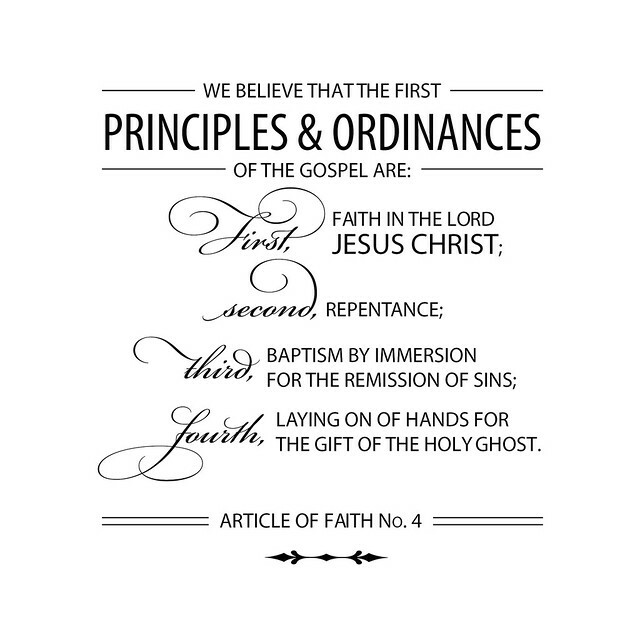 The original file for the 4th article of faith graphic (if you’d like to edit it) is in Adobe Illustrator CS5. 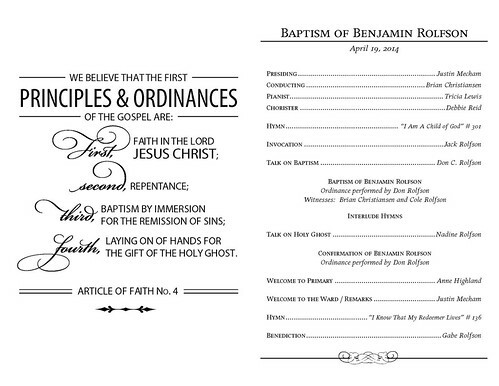 I’m happy to share it with you if you’d like but you’d need the fonts, etc., in order to edit any of the text…The file for the baptismal program is in Adobe InDesign and I’m happy to send that too but you’d need to find and install the right fonts, etc., to get it to look exactly the same as mine. Could I please get an editable copy of your program too. That would be awesome. It is so well done. Thank you. My husband is the ward mission leader and I get to do the programs. I don’t have Adobe or anything other than what comes with Excel or MS Word. I do like the wording and lay out of the program. Can you save and share in Word formatting? I love the AofF, but more concerned with the rest for now. Sorry to say that Adobe products don’t convert to Word or Excel very well — I could send a picture (pdf) of the document, but then you wouldn’t be able to customize or change anything. They’re just apples and oranges as far as software goes. It would take hours and hours to recreate it in Word…and I don’t work in Word very well. I would love to get the link to an editable copy of your program! Hello! We are having a baptism for a YW tomorrow!! Please send me the editable download for your program… It is beautiful!! I love this! 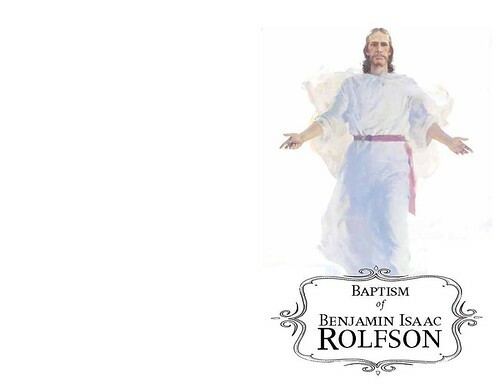 My son is getting baptized this Saturday, would it be possible to get a version to edit soon? 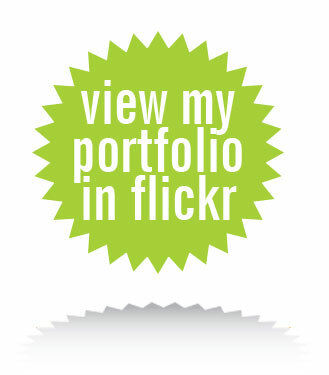 I have Adobe products (Illustrator and Photoshop). Thank you so much! Been so busy with the holidays I just saw this! I’m sure whatever you designed turned out wonderful!! These are not in editable files unless you have Adobe pro products like Illustrator, Photoshop and InDesign. Cn I pls get a copy emailed to me also pls. I need it for tomorow. The file is in Adobe Creative Suite. You won’t be able to edit it if I send it to you unless you have Adobe InDesign. I love this! Could I please get an editable copy sent to my email? Thank you so much!! The file is in Adobe Creative Suite. You won’t be able to edit it if I send it to you unless you have Adobe InDesign and Illustrator (and the proper fonts). This is so well done. Would you mind sending me this file for my son’s baptism? Did you say that it should work in Photoshop? I love this… any chance I can get it in an editable format. Hi could i get the editable copy, i love this.